December 22, 2010 - Department of Homeland Security (DHS) Secretary Janet Napolitano on Tuesday announced that 100 percent of passengers on flights within or bound for the United States are now being checked against government watchlists fulfilling a key 9/11 Commission recommendation a month ahead of schedule. Under Secure Flight, the Transportation Security Administration (TSA) prescreens passenger name, date of birth and gender against terrorist watchlists before passengers receive their boarding passes. In addition to facilitating secure travel for all passengers, the program helps prevent the misidentification of passengers who have names similar to individuals on government watchlists. 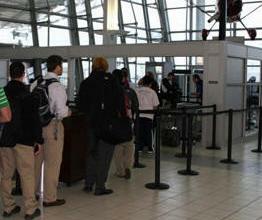 Prior to Secure Flight, airlines held responsibility for checking passengers against watchlists. ?Each and every one of the security measures we implement serves an important goal: providing safe and efficient air travel for the millions of people who rely on our aviation system every day,? said Secretary Napolitano. ?Secure Flight makes air travel safer for everyone by screening every passenger against the latest intelligence before a boarding pass is issued.? ?The threats we face in the aviation sector are real and evolving, and we must confront them with strong and dynamic security measures,? said TSA Administrator John S. Pistole. ?Secure Flight bolsters our efforts to be more intelligence-driven and risk-based in our approach to aviation security. Our industry partners? strong commitment to security was critical to reaching the full implementation of this vital counterterrorism program ahead of schedule.? ?We are pleased that DHS and TSA, with the cooperation of ATA and its member airlines, were able to reach this important security milestone ahead of schedule,? said Air Transport Association President and CEO James C. May. ?We look forward to working with them and their security counterparts around the world to continue to improve security while streamlining passenger processing ? a win-win for everyone. ?